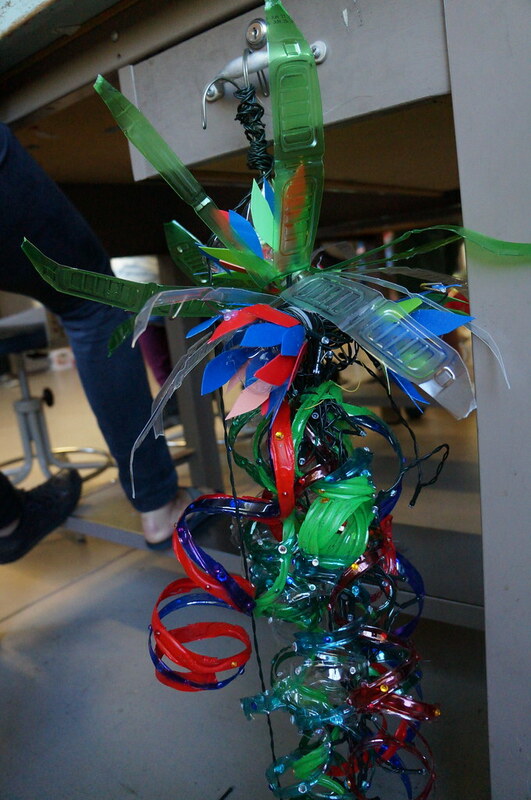 Created from dozens of plastic bottles, the photo above shows a Sustainable Design student holding her teams interpretation of a Ceanothus (California lilac) blossom. This sculpture along with dozens of others, are now hanging from the trellis in the Arboretum’s Valley Heritage Garden. Solar-powered light sculptures created by 48 students in Studio in Sustainable Design (Design 127B) taught by Design Department faculty Ann Savageau and Bob Morgan, are currently on display in the Arboretum’s newly-constructed Arboretum GATEway Garden. Students collaborated with the UC Davis Arboretum and Public Garden to create sculptures based on plants found in the Arboretum and in our campus’s botanical conservatory. They gave new life to plastic containers of all sorts, demonstrating that there is no such thing as waste, and that the possibilities for creative reuse of post-consumer waste is virtually limitless.Solar-powered light sculptures created by 48 students in Studio in Sustainable Design (Design 127B) taught by Design Department faculty Ann Savageau and Bob Morgan, are currently on display in the Arboretum’s newly-constructed Arboretum GATEway Garden.